WELCOME TO SF CANDY BAR BUFFET! Fun Popcorn Buffets, Sweet Party Favors, and Memorable Photo Booths! 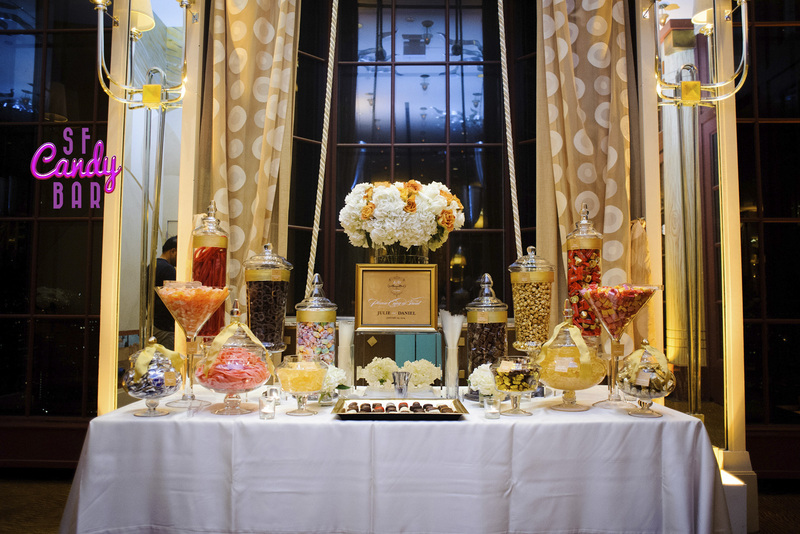 SF Candy Bar will thoughtfully design and craft a deliciously sweet candy buffet design with the most successful options your taste buds could imagine. We take the guess work out of candy buffets, and make your experience fun! Stay up-to-date with SF Candy Bar by following us on Facebook & Instagram. We love sharing our experiences with our fans! Please tag us at @SFCANDYBAR and #sfcandybar. providing a unique and personalized flair for any special night. Let’s Come up with A Design Together! 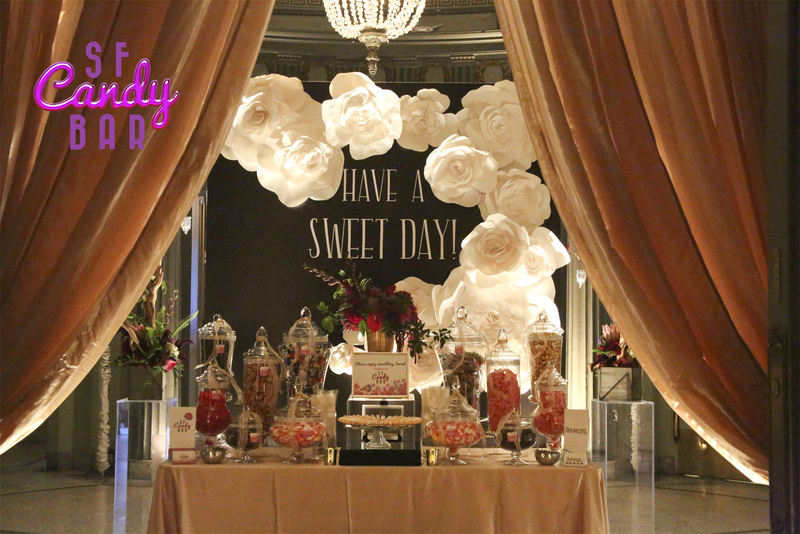 At SF Candy Bar we have created strategic menus and designs that appeal to various crowds. We confidently work with our clients to suggest best practices to give you and your guests a fabulous experience! We love working consistently with our clients. Thank you for the continued business! SF Candy Bar does an amazing job making the candy magical. We’ve hired SF Candy Bar at two of our company parties and each time they were a hit. Excellent presentation and the candy is amazing. I love their marshmallow poles. SF Candy Bar does an amazing job making the candy magical. We’ve hired SF Candy Bar at two of our company parties and each time they were a hit. Excellent presentation and the candy is amazing. I love their marshrnallow poles. 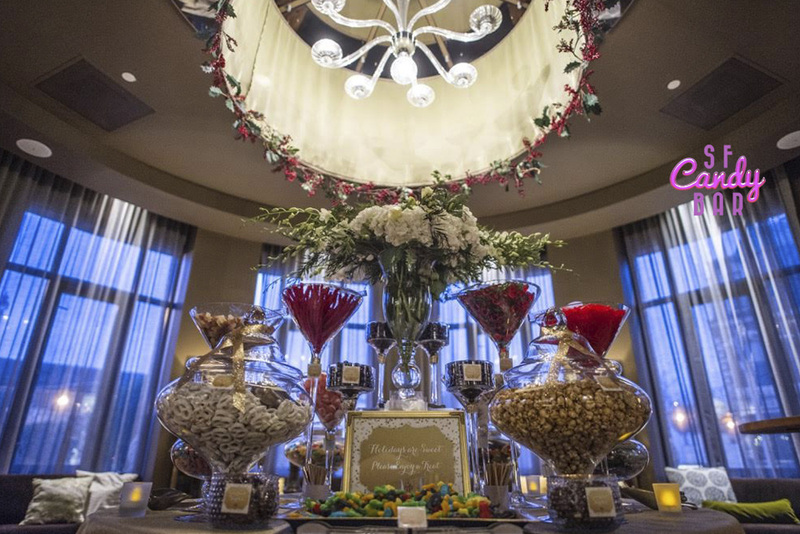 Why not further spruce up your upcoming event with a Candy Buffet at your event’s reception? 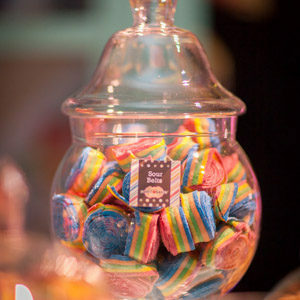 Artfully crafted candies for your guests are a great way of making your event more colorful and sweet. 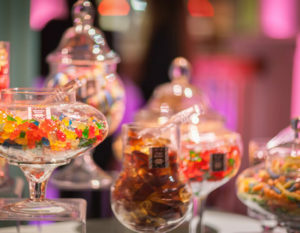 If you are looking for a trusted custom sweet party favors provider in the areas of San Francisco, San Jose, Santa Clara, San Mateo, and Bay area for your dream candy buffet, the SF Candy Bar Buffet team is just the perfect company for you! 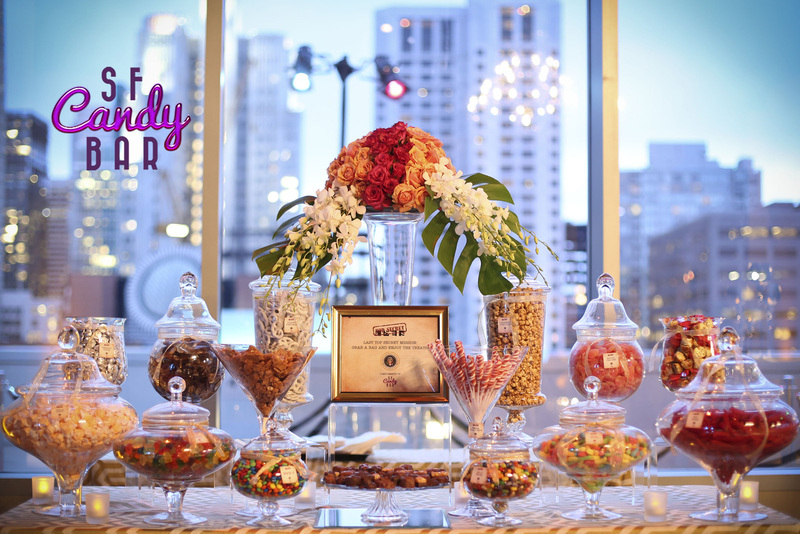 Helmed by a team of experts with years of experience, SF Candy Bar Buffet provides custom designs and delicious candy bar buffets, healthy trail mix buffets, fun popcorn buffets, and other sweet party favors in and around San Francisco, San Jose, Santa Clara, San Mateo, and the Bay area. With our genuine commitment to making events more exciting, we work collaboratively with our clients to ensure that we deliver the best customizable candy experience that guests will definitely remember. Whether it’s a corporate event or a personal one, at SF Candy Bar Buffet, we provide you the perfect personalized sweet party favors that can surely take your event to the next level! Serving the areas of San Francisco, San Jose, Santa Clara, San Mateo, and Bay Area. Contact us now for a free initial consultation. We’ll be more than happy to help you host the sweetest event! Your daughter’s birthday party is coming up and now you’re looking for a credible provider of best personalized sweet party favors San Francisco, best personalized sweet party favors Bay area, best personalized sweet party favors San Jose, best personalized sweet party favors San Mateo, best personalized sweet party favors Santa Clara, best personalized party favors San Francisco, best personalized party favors Bay area, best personalized party favors San Jose, best personalized party favors San Mateo, best personalized party favors Santa Clara, best personalized custom party favors San Francisco, best personalized custom party favors Bay Area, best personalized custom party favors San Jose, best personalized custom party favors San Mateo, best personalized custom party favors Santa Clara. 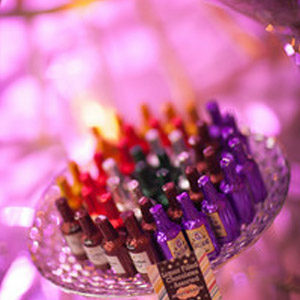 Be smart and get the services of SF Candy Bar for only the best sweet party favors San Francisco, best sweet party favors Bay area, best sweet party favors San Jose, best sweet party favors San Mateo, best sweet party favors Santa Clara, best party favors San Francisco, best party favors Bay area, best party favors San Jose, best party favors San Mateo, best party favors Santa Clara, best custom party favors San Francisco, best custom party favors Bay Area, best custom party favors San Jose, best custom party favors San Mateo, best custom party favors Santa Clara. Your daughter’s party will definitely be a blast because of our amazing sweet party favors San Francisco, sweet party favors Bay area, sweet party favors San Jose, sweet party favors San Mateo, sweet party favors Santa Clara, party favors San Francisco, party favors Bay area, party favors San Jose, party favors San Mateo, party favors Santa Clara, custom party favors San Francisco, custom party favors Bay Area, custom party favors San Jose, custom party favors San Mateo, custom party favors Santa Clara. Helmed by years of experience and expertise in creating only the best personalized sweet party favors San Francisco, best personalized sweet party favors Bay area, best personalized sweet party favors San Jose, best personalized sweet party favors San Mateo, best personalized sweet party favors Santa Clara, best personalized party favors San Francisco, best personalized party favors Bay area, best personalized party favors San Jose, best personalized party favors San Mateo, best personalized party favors Santa Clara, best personalized custom party favors San Francisco, best personalized custom party favors Bay Area, best personalized custom party favors San Jose, best personalized custom party favors San Mateo, best personalized custom party favors Santa Clara, we, at the SF Candy Bar, is committed to making parties more memorable and enjoyable with our delightfully crafted and delicious sweet party favors San Francisco, sweet party favors Bay area, sweet party favors San Jose, sweet party favors San Mateo, sweet party favors Santa Clara, party favors San Francisco, party favors Bay area, party favors San Jose, party favors San Mateo, party favors Santa Clara, custom party favors San Francisco, custom party favors Bay Area, custom party favors San Jose, custom party favors San Mateo, custom party favors Santa Clara. Our best sweet party favors San Francisco, best sweet party favors Bay area, best sweet party favors San Jose, best sweet party favors San Mateo, best sweet party favors Santa Clara, best party favors San Francisco, best party favors Bay area, best party favors San Jose, best party favors San Mateo, best party favors Santa Clara, best custom party favors San Francisco, best custom party favors Bay Area, best custom party favors San Jose, best custom party favors San Mateo, best custom party favors Santa Clara are created by our team of creative experts. To ensure that we deliver only the best personalized sweet party favors San Francisco, best personalized sweet party favors Bay area, best personalized sweet party favors San Jose, best personalized sweet party favors San Mateo, best personalized sweet party favors Santa Clara, best personalized party favors San Francisco, best personalized party favors Bay area, best personalized party favors San Jose, best personalized party favors San Mateo, best personalized party favors Santa Clara, best personalized custom party favors San Francisco, best personalized custom party favors Bay Area, best personalized custom party favors San Jose, best personalized custom party favors San Mateo, best personalized custom party favors Santa Clara, we work closely with our clients to accurately capture their vision for their desired sweet party favors San Francisco, sweet party favors Bay area, sweet party favors San Jose, sweet party favors San Mateo, sweet party favors Santa Clara, party favors San Francisco, party favors Bay area, party favors San Jose, party favors San Mateo, party favors Santa Clara, custom party favors San Francisco, custom party favors Bay Area, custom party favors San Jose, custom party favors San Mateo, custom party favors Santa Clara. With our best sweet party favors San Francisco, best sweet party favors Bay area, best sweet party favors San Jose, best sweet party favors San Mateo, best sweet party favors Santa Clara, best party favors San Francisco, best party favors Bay area, best party favors San Jose, best party favors San Mateo, best party favors Santa Clara, best custom party favors San Francisco, best custom party favors Bay Area, best custom party favors San Jose, best custom party favors San Mateo, best custom party favors Santa Clara, your party is definitely taken up to the next level. All of our sweet party favors San Francisco, sweet party favors Bay area, sweet party favors San Jose, sweet party favors San Mateo, sweet party favors Santa Clara, party favors San Francisco, party favors Bay area, party favors San Jose, party favors San Mateo, party favors Santa Clara, custom party favors San Francisco, custom party favors Bay Area, custom party favors San Jose, custom party favors San Mateo, custom party favors Santa Clara are well-thought of, delicious, and beautifully-created. Guests at your party will surely be delighted with our delightfully amazing and best sweet party favors San Francisco, best sweet party favors Bay area, best sweet party favors San Jose, best sweet party favors San Mateo, best sweet party favors Santa Clara, best party favors San Francisco, best party favors Bay area, best party favors San Jose, best party favors San Mateo, best party favors Santa Clara, best custom party favors San Francisco, best custom party favors Bay Area, best custom party favors San Jose, best custom party favors San Mateo, best custom party favors Santa Clara which they can eat while partying. Level up your party through our sweet party favors San Francisco, sweet party favors Bay area, sweet party favors San Jose, sweet party favors San Mateo, sweet party favors Santa Clara, party favors San Francisco, party favors Bay area, party favors San Jose, party favors San Mateo, party favors Santa Clara, custom party favors San Francisco, custom party favors Bay Area, custom party favors San Jose, custom party favors San Mateo, custom party favors Santa Clara! Be it a corporate event or a personal one such as birthdays or weddings, we create only the best sweet party favors San Francisco, best sweet party favors Bay area, best sweet party favors San Jose, best sweet party favors San Mateo, best sweet party favors Santa Clara, best party favors San Francisco, best party favors Bay area, best party favors San Jose, best party favors San Mateo, best party favors Santa Clara, best custom party favors San Francisco, best custom party favors Bay Area, best custom party favors San Jose, best custom party favors San Mateo, best custom party favors Santa Clara for a wide array of events. Your guests’ party experience will definitely be more enthralling with our sweet party favors San Francisco, sweet party favors Bay area, sweet party favors San Jose, sweet party favors San Mateo, sweet party favors Santa Clara, party favors San Francisco, party favors Bay area, party favors San Jose, party favors San Mateo, party favors Santa Clara, custom party favors San Francisco, custom party favors Bay Area, custom party favors San Jose, custom party favors San Mateo, custom party favors Santa Clara. Say no more to a boring party because our sweet party favors San Francisco, sweet party favors Bay area, sweet party favors San Jose, sweet party favors San Mateo, sweet party favors Santa Clara, party favors San Francisco, party favors Bay area, party favors San Jose, party favors San Mateo, party favors Santa Clara, custom party favors San Francisco, custom party favors Bay Area, custom party favors San Jose, custom party favors San Mateo, custom party favors Santa Clara can amp up the party ambience in no time. At SF Candy Bar, our sweet party favors San Francisco, sweet party favors Bay area, sweet party favors San Jose, sweet party favors San Mateo, sweet party favors Santa Clara, party favors San Francisco, party favors Bay area, party favors San Jose, party favors San Mateo, party favors Santa Clara, custom party favors San Francisco, custom party favors Bay Area, custom party favors San Jose, custom party favors San Mateo, custom party favors Santa Clara include bar buffets, healthy trail mix buffets, and fun popcorn buffets. Contact us now for free initial consultation as to what sweet party favors San Francisco, sweet party favors Bay area, sweet party favors San Jose, sweet party favors San Mateo, sweet party favors Santa Clara, party favors San Francisco, party favors Bay area, party favors San Jose, party favors San Mateo, party favors Santa Clara, custom party favors San Francisco, custom party favors Bay Area, custom party favors San Jose, custom party favors San Mateo, custom party favors Santa Clara best fit your needs. Get our sweet party favors San Francisco, sweet party favors Bay area, sweet party favors San Jose, sweet party favors San Mateo, sweet party favors Santa Clara, party favors San Francisco, party favors Bay area, party favors San Jose, party favors San Mateo, party favors Santa Clara, custom party favors San Francisco, custom party favors Bay Area, custom party favors San Jose, custom party favors San Mateo, custom party favors Santa Clara if you want to have the best party in your life yet.